Results of the show Tuesday afternoon, as the show ends Monday, May 2. I started writing this blog from my booth at the preview party of The Chicago Merchandise Mart International Antiques Show. I’m glad to say that I couldn’t finish writing it there because it was fairly busy later in the evening. At first there were quite a few people, but very few questions and little interest. Things picked up during the latter half of the party, resulting in a couple of sales and one item on hold. Pretty good for a preview party. The preview party in Los Angeles a couple of weeks ago was also good. To the credit of the Merchandise Mart, the food and drink were excellent and plentiful, as always. This is really a show you should make the time to visit. There are very few shows in the US with the same quantity and quality of dealers. M.S. Rau of New Orleans has an enormous booth filled with one-of-a-kind rarities. Green River Stone Co. has wall plaques of river animal and plant fossils over a million years old, removed directly from the river. The diversity of dealers in this show is wonderful, from Asian to art to Chanel purses to silver. There are no junk dealers in this show. 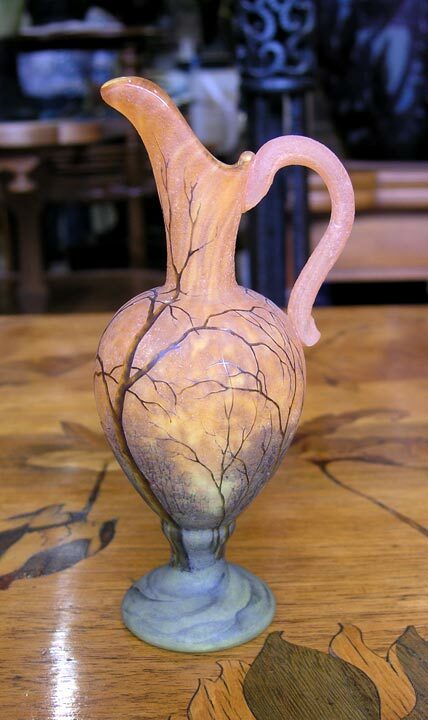 You’ll surely like what I’ve brought, including many items which will be exhibited for the first time; European ceramics by Clement Massier, Dalpayrat, Zsolnay, and Amphora; Daum vases including a very rare and fine mushroom example, Galle vases and Icart etchings. I hope you come and visit. The hours are Friday 11 AM – 7 PM, Saturday 11 AM – 7 PM, Sunday 11 AM – 6 PM and Monday, 11 AM – 3 PM. 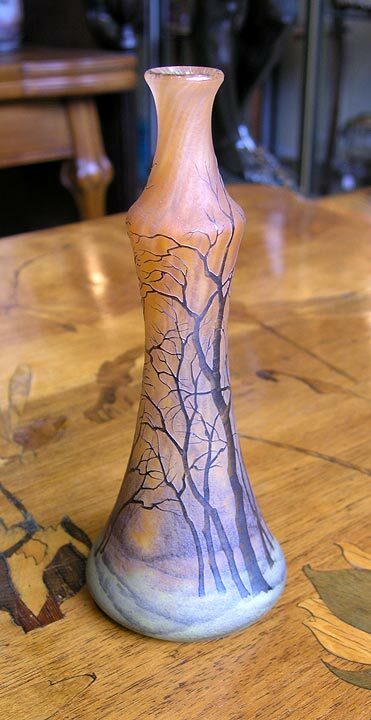 One of the fine new Daum Nancy vases I will be exhibiting for the first time. The Chicago Merchandise Mart International Antiques Show will open to the public on Friday, April 29 and remain open until Monday, May 2, 2011. If you only attend one antique show a year, this is the one you were waiting for. 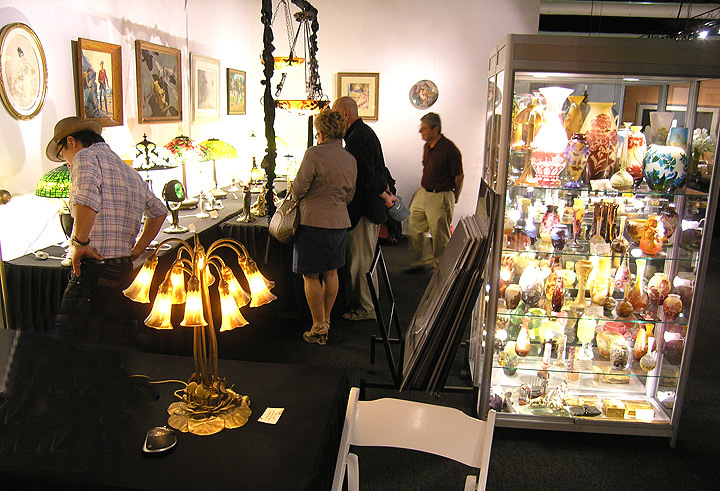 The show is everything you would want from an antique show — it’s elegant, it’s moderately large, it has world-class exhibitors. What else? It’s in downtown Chicago, conveniently located a few blocks west of Michigan Ave, right on the river. It’s spring, so the weather will be near perfect, with fabulous floral displays around the city, especially the tulips on Michigan Ave. You can eat at some of the best restaurants in the world and shop in some of the best stores. Convinced yet? Some of the exhibitors exhibit at very few shows, so you’ll have one of the rare chances to see them. For example, M.S. Rau of New Orleans exhibits at this show and usually bring incredible items, including paintings by Norman Rockwell and Pierre-Auguste Renoir. Many of the exhibitors are international, from England, France, Italy and Turkey. Greenwald Antiques has one of the most fantastic items I’ve ever seen at a show. 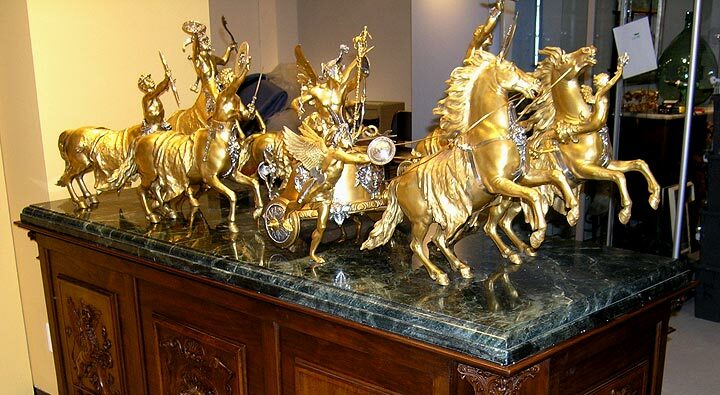 It’s an amazing 6 feet long, gilded bronze grouping of horses and a chariot by the French sculptor E. Picault, given as a gift by the citizens of a town to the local sheriff in England in 1880, with the original presentation plaque, marble base and hand-carved furniture base. It’s a show-stopper. The show begins on Thursday evening with a preview party. I’m not a fan of preview parties, but the last one in LA was good. Maybe one day I’ll change my mind about preview parties. In the meantime, I’ll appreciate the good food and drink. Personally, I’m bringing some of the finest items I’ve ever shown. 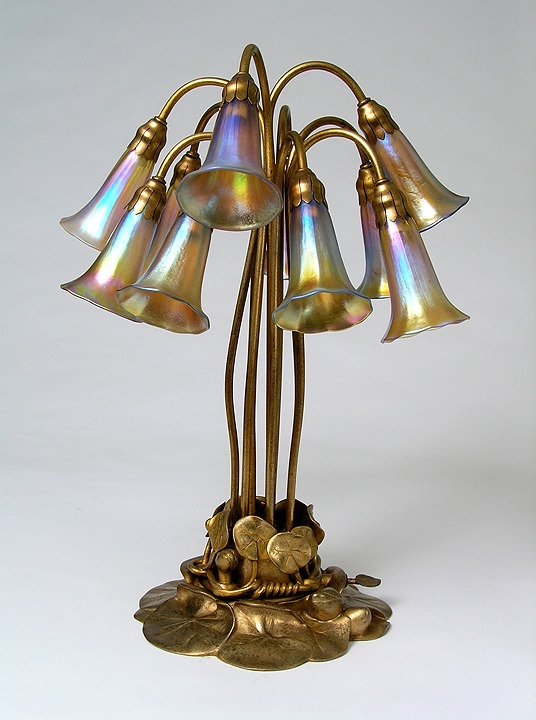 We will have an incredible 18″ Tiffany Studios Peony table lamp with superb red flowers plus another dozen Tiffany lamps, including four floor lamps. We’re just back from a European buying trip, so we’ll have some great Daum & Gallé glass that will exhibited for the first time. I’ll post results on Tuesday, because the show ends on Monday. 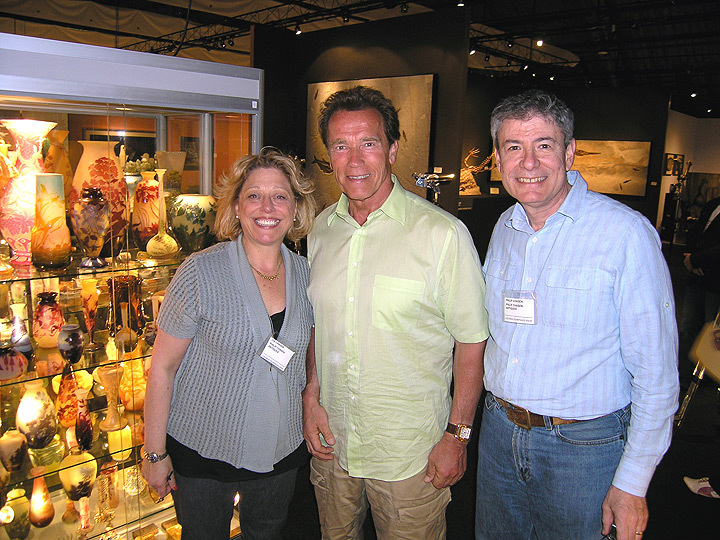 The Los Angeles Antiques Show ended on Sunday, April 17, 2011, with most exhibitors smiling. The show, very professionally managed by Rosemary Krieger and her Dolphin Promotions staff, ended a four-day run, which began with a preview party last Wednesday night. If you follow my blog, you know I’m not a fan of preview parties (that’s saying it mildly). For the most part, the attendees are there to see and be seen. 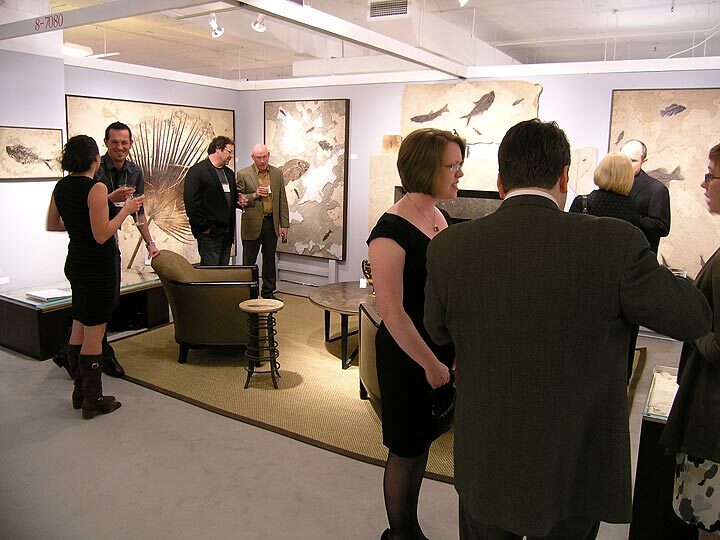 Most preview parties benefit a specific charity, with the guests usually having little interest in purchasing antiques. After the Los Angeles Antiques Show preview party, I may have to stop bitching (or at least slow down). This was a high-powered party with a lot of famous, wealthy, and powerful people. There were more beautiful women than usual, many of whom were all legs (not that I noticed). Heidi Klum (lovely in person) and Keanu Reeves were in attendance, as well as billionaire businessman, Eli Broad. Sales were good at the preview party, a phenomenon I am not used to, but could get used to pretty easily. I’m throwing down the gauntlet – a challenge to preview party guests at all shows — buy something from me and I will stop bitching about preview parties. Wouldn’t that be a kick? Me writing about looking forward to a preview party? Not likely to happen. I hoped the excitement would continue to the show, but attendance was very light to moderate most days and never came close to the preview party. The good part is that the right people showed up, so sales continued slowly and erratically (Saturday was a complete bust). As usual for most shows, the hours and days were too long and brutal – 4 hours at the preview party, 8 hours on Thursday, 10 hours on Friday, 8 hours on Saturday and 6 hours on Sunday, for a total of 36. Both dealers and the public would have been better served with shorter hours and a later starting time of noon. Sunday was fun with a couple of nice sales and visits by celebrities, include Jaclyn Smith (who at 63 still looks great), Arnold Schwarzenegger, and jeweler Neil Lane. It would have been even more fun if they had made purchases. At least Arnold and Neil were kind enough to pose for photos. In asking around, most dealers did well. One dealer in 19th century decorative objects had a great show. London dealers in jewelry and silver did very well. A dealer in Asian antiques had substantially improved results from last year. A dealer of fine antiques at full retail prices and another of fossils did not do well. Personally the show was a moderate success – better than last year and good enough to return next year. Sales were best for Tiffany Studios glass and objects and Icart etchings. The post on the results of the Los Angeles Antiques Show will be posted during the day on Tuesday as I was traveling all day Monday. 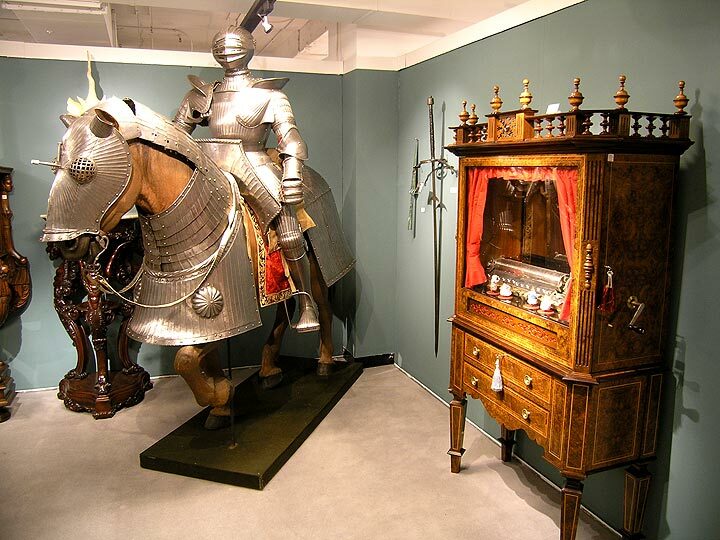 The best antique show in Los Angeles will be opening this week — The Los Angeles Antiques Show. The preview party will be held on Wednesday evening from 6-10 PM, to benefit PS Arts, an organization dedicated to restoring arts education to public schools in Central and Southern California. It will be held at the Barker Hangar at the Santa Monica Air Center and will run Thursday: 11 AM to 7 PM, Friday: 11 AM to 9 PM, Saturday: 11 AM to 7 PM and Sunday: 11 AM to 5 PM. The show will have 60 outstanding dealers from around the United States and Europe, including one from Italy and six from England. The categories will be very diverse and will include silver, glass, lamps, art and Asian. All of the objects will be vetted by experts. Only the very best shows in the country are vetted, so you can shop with assurance. I’m bringing some really great items this time. I just picked up a Tiffany 18″ Peony lamp, to die for. Also a Tiffany 18″ Oak Leaf & Acorn table lamp. Oh, and a Tiffany 10-light lily table lamp. LA will be the first show for them. Don’t forget that I have an incredible selection of French cameo glass, including Daum Nancy and Gallé, and American glass, including Tiffany Studios, Quezal, and Steuben. Last year’s show was interesting. It didn’t appear that I was doing very well, but then a flurry of activity on the last day convinced me I should try the show again. If you’re in LA and would like for me to continue to exhibit there, come to show and consider making a purchase. At least come to the show and have a look! 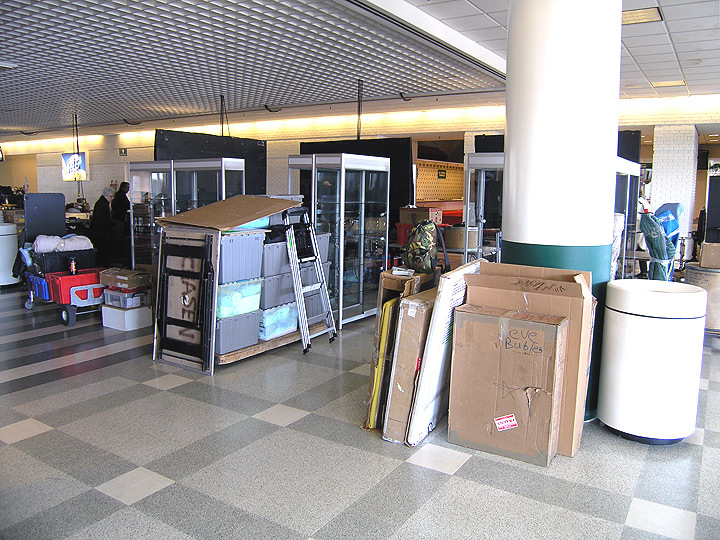 The Arlington Park Racetrack Antiques Show ended yesterday, April 3, 2011. Most of the dealers I spoke to were quite pleased with their results. One dealer who sells furniture sold quite a few pieces. Another who sells jewelry and diverse objects told me he sold a bracelet for $100,000. (I can’t verify that information, so my best guess is that he sold an expensive bracelet, but who knows the price.) I didn’t hear a single complaint from any dealer, except one, and it wasn’t really a complaint. He was just disappointed. The problem was that he’s too specialized and very few buyers showed up for his specialty. Personally, the show went well for me, but with few sales. Based on the number of bona fide buyers who showed up, I should have had a really great show. Too many potential buyers were right on the fence and decided not to make a purchase. It could easily have gone the other way and then I would be raving about my great show. Oh well! I really would like to rave about my great show, but it wasn’t meant to be. 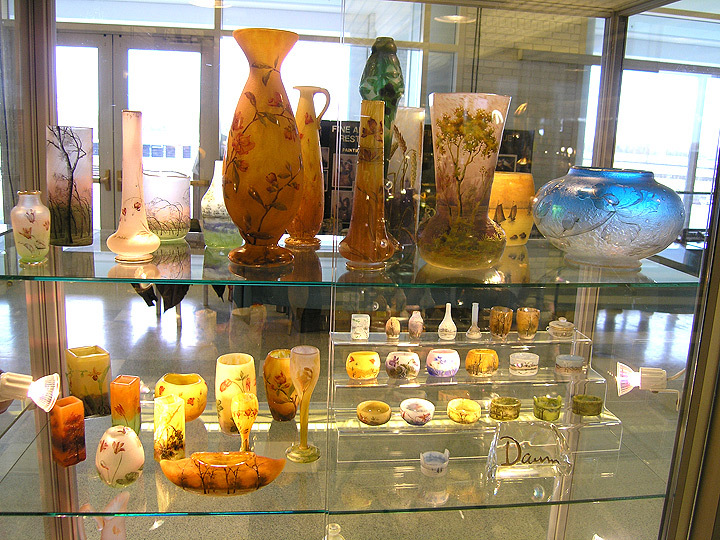 Some of the Daum Nancy glass on display in my booth. 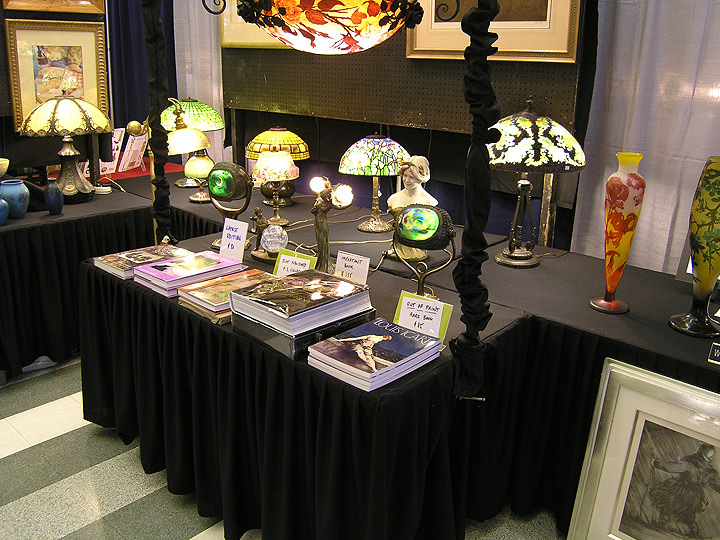 Interest and sales was greatest in Tiffany lamps and glass. French glass was quiet at this show, but not otherwise. The French glass market, mainly Gallé and Daum Nancy glass, is quite active. Each show has a personality, depending on who shows up. This time the Tiffany buyers showed up. It’s sad to see that the show is shrinking. There was the bare minimum number of dealers for a show. Unfortunately, if the show shrinks any more, there won’t be a show. I’m hoping that the dealers who did well will tell their friends to exhibit there the next time and the show will expand. There are so many good buyers in the area, it would be a serious shame if the show were to close. Are you dealers reading this? Call Shawn Hastings and sign up for the next Arlington Park Racetrack Antiques Show in October. (618) 444-2803. 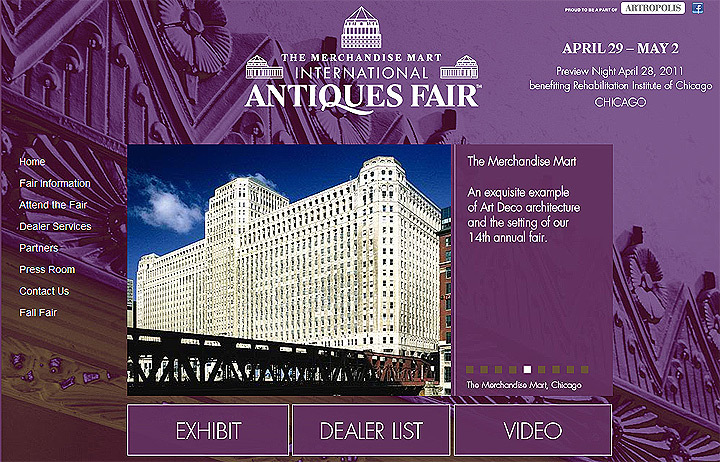 Unfortunately I won’t be at Arlington this coming October because it conflicts with the Fall edition of the Merchandise Mart Antiques Show in downtown Chicago. They’re the same weekend. Bummer! I would love to exhibit at one show and then do the other show the following week. I hope that Shawn can change his dates. 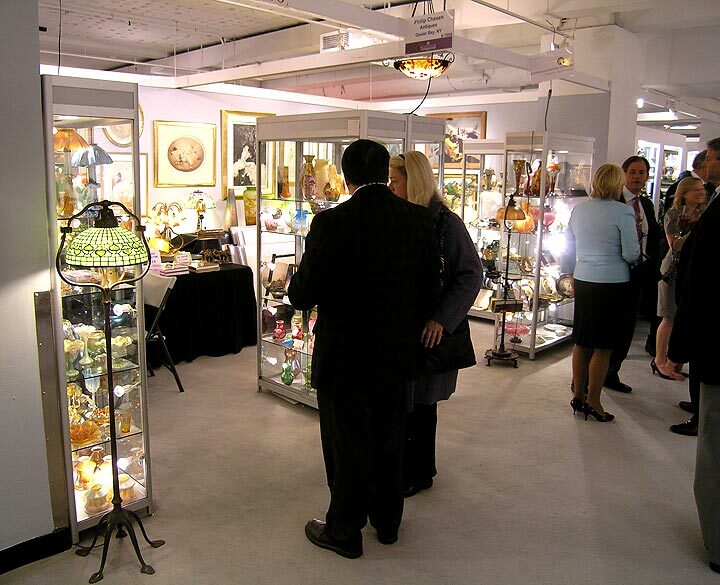 We’ll be back soon in the Chicago area for the Spring edition of the Merchandise Mart Antiques Show. It will start on Friday, April 29, 2011 and end on Monday, May 2, 2011. Before then we’ll be exhibiting at the Los Angeles Antiques Show at the Barker Hangar at the Santa Monica Air Center, April 14 to April 17. 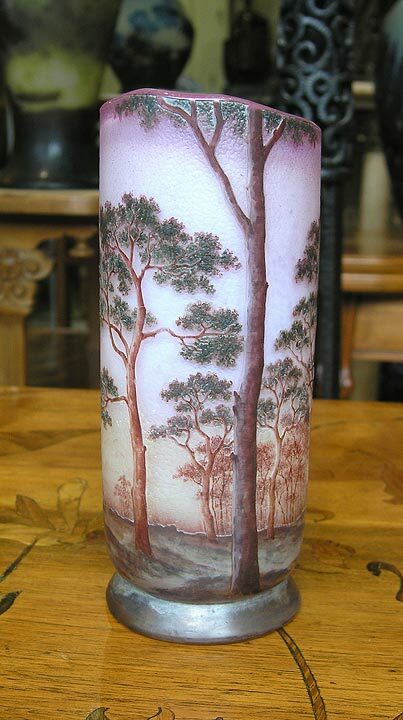 Then we’re going on a buying trip, so we should have some very fine new items for the Merchandise Mart Show, especially French Cameo Glass. Make the time to come and visit the show. It’s one of the best in the entire United States, so it’s worth a trip from anywhere.